There’s something undeniably boring about an archive that in so many ways seems anathema to ephemeral, innovation-obsessed digital culture. Over the weekend a blog post on Boing Boing drew attention to the fact that MySpace’s archive between 2003-2015 had mysteriously vanished. It turns out the files had been gone for over a year before MySpace gave confirmation. Clearly company didn’t have any plans to make an announcement about the fact that a server migration had gone awry, deleting more than 50 million songs from 14 million artists. And why should they? The platform was profit-driven, and it sure as hell wouldn’t want to be boring. It quickly became clear that there was no one to hold accountable. Who do you call? The faceless “Data Privacy Officer” at the washed-up social media platform? What does MySpace’s data privacy office know about your hopes and dreams, about your favourite scene band and the moody hip hop beat-maker you followed when you were 14? In the wake of the MySpace’s deletion of user-generated content we should be demanding that music streaming services be nationalised. Full expropriation, an end to the for-profit music platform system - this is the only way to preserve cultural artefacts. An untold number of MySpace demo tapes float in the ether. There have been calls to nationalise Facebook, which, as a communication platform that survives off of user data, makes a good deal of sense. For music fans and for those who make music, we should be working towards collectivising streaming platforms. Give the Soundcloud rappers a stake in our national industries. Let Bandcamp drone artists march, arm and arm, into the soft bosom of the state. In the ashes of MySpace, let’s preserve music like our water mains and roadways. These organisations work off of user-generated content, and need to be understood not as vehicles of “disruption”, but as the cultural institutions that they are. What would a nationalised streaming service look and sound like? Rather than acting like the BBC, churning out high-brow taste-making, a user-generate, publicly-owned company could support artist of all stripes, and see genuine involvement from listeners. It would pay more than Spotify’s measly $0.006 to $0.0084 per stream, because the funds would be redistributed to artists and linked more closely to arts funding. A nationalised platform could be more efficient, and treated properly like a public utility, and hooked up to a national archive. As Drake’s recent high-volume, super-long album demonstrates, the way artists make work has changed in response to the dominance of streaming platforms - and users should have a stake in that. Keep the user-generated structure, toss out the exploitative head management. In response to Soundcloud’s impending doom, technologist and Holly Herndon collaborator Mat Dryhurst has proposed collectivising SoundCloud through a cryptocurrency token system. The token system would allow for a user buyout of the platform and lead to a unified base of fans and artists, spurred by the passion of edgy Soundcloud beatmakers the world over. “Every artist or label has ideas about how they could better engage with their public, but they do not currently have a say in the design of platforms,” Dryhurst writes. The solution is innovative, but it doesn’t go far enough. This doesn’t need to be about token-holders. Ultimately, this isn’t a design problem, nor is it an archiving problem - this is about power and democratic control. Web archiving isn’t a neutral process: things get archived because there’s a responsibility and a goodwill to do so. Having a team of volunteers perform archive, which is what’s happened in response to Google Plus’ imminent shutdown, isn’t going to be sustainable. Institutions like the Internet Archive only exist because institutional players are profit-driven, and archiving gets dumped on users, who are fuelled either out of sentimental nostalgia or an intellectualised commitment to free information - both of which are fantastic, but, as anyone who’s been online can tell you, neither of which pay the bills. Without nationalised cultural organisations that can legitimately service a mass of internet users, the horizons look bleak. Vine’s archive is unsearchable, and Vine’s annoying, way cooler younger sibling, TikTok is just as ephemeral (and more tightly integrated with music streaming). There’s been some speculation about Instagram’s potential to become the next home of music streaming, mainly through the “Instagram Live” feature, but there has yet to be any standardised method for preserving the broadcasts. Like Bandcamp today, MySpace helped to foster a generation of experimental music. 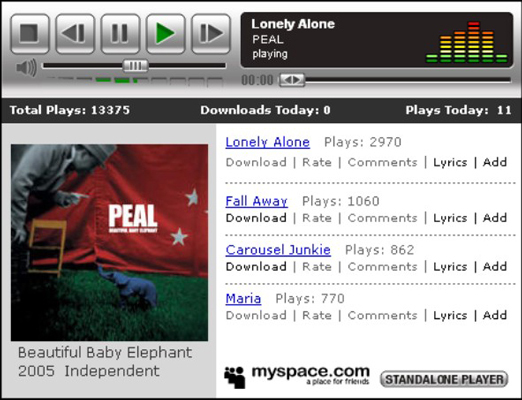 The music on MySpace may have been, on the whole, poor quality, and its may have been, on the whole, heavily associated with a particularly cringe rock nostalgia: Guns N' Roses’ much anticipated and disdained 2008 album 'Chinese Democracy' was released digitally on MySpace, Arctic Monkeys and Lily Allen also owe a lot to the social media site. But there was phenomenal user investment in the streaming platform, and it helped to shape culture. The dream of a utopian internet glitched out long before MySpace’s server migration. Let’s honour the ghosts of MySpace’s lost albums and nationalise streaming.